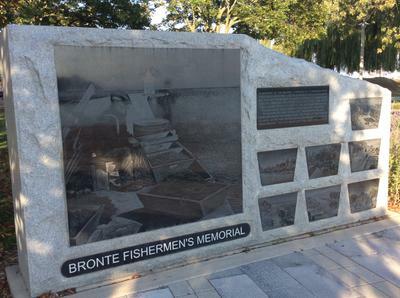 In memory of the Bronte Commercial Fishermen who ventured onto the Lake in good weather and bad to set and lift their nets to earn a living catching fish: ciscoes, herring, whitefish and lake trout. The main fish caught were cleaned at the dockside shanties, packed in ice and shipped to markets in Toronto, Hamilton and New York City. Twenty-two boats operated from the harbour at the peak of the fishing season. As the fish dwindled so did the boats fishing from Bronte. The last boat left the lake circa 1950s.